My week one progress post is here. Same as Tuesday's breakfast - cold cereal. Same as Tuesday's lunch - tuna salad and a grainy breadroll. 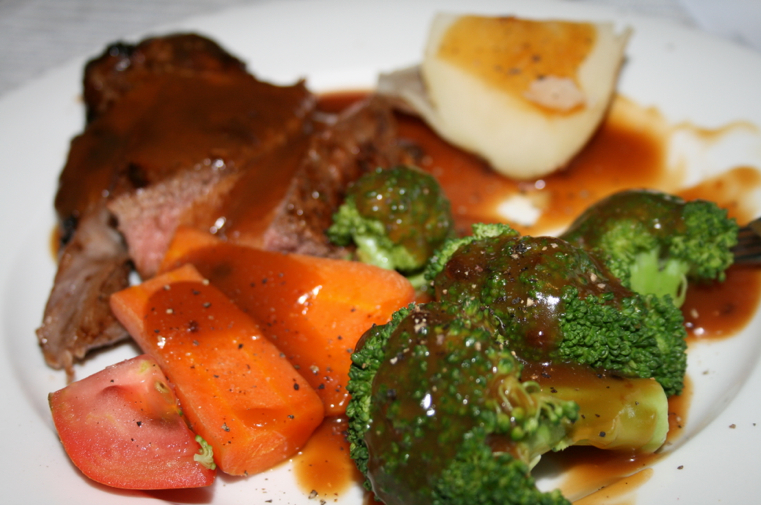 Rump steak with potato, broccoli, carrots, tomatoes (from our garden) and, gravy, of course! We buy all of our steak from a butcher located in Coomera (between the Gold Coast and Brisbane) called Springbok Foods. My husband is South African, so this little South African supermarket is a familiar, comforting taste of home for him. The bonus is that they sell the most tender, delicious AGED rump steak for around $17-$19/kg. It is also cheaper if you buy a whole side of rump. For this dinner, my husband seasoned the meat with Spur Seasoning Salt (also from Springbok Foods) and then sealed it on both sides on the BBQ. Then he bastes the steak while it is grilling with Spur Marinade Grill Basting sauce (which I've just realised that I forgot to add to my calorie count for the day). While he was grilling the meat, I boiled potatoes (with the skin on - lose so many nutrients when you peel it off, plus it just takes longer to prepare) and steamed fresh broccoli and carrots. I also chopped up some tomatoes from our vegetable garden. Then I made the gravy (straight from a packet with boiling water, I'm not fancy). Hmm, I didn't exercise. My excuse was that our (almost) four year old was awake for 1.5 hours in the middle of the night and I was too tired after putting them to bed to go downstairs and walk on the treadmill.